"What does, "The proof is in the pudding", even mean?" I'm glad you asked! According to The Word Detective, “The proof is in the pudding” is a popular figure of speech meaning “the quality, effectiveness or truth of something can only be judged by putting it into action or to its intended use” and when applied to food, according to The Word Detective, "A dish may have been made from a good recipe with fresh ingredients and look delicious, but you can really only judge it by putting it in your mouth. The actual taste is the only true criterion of success." 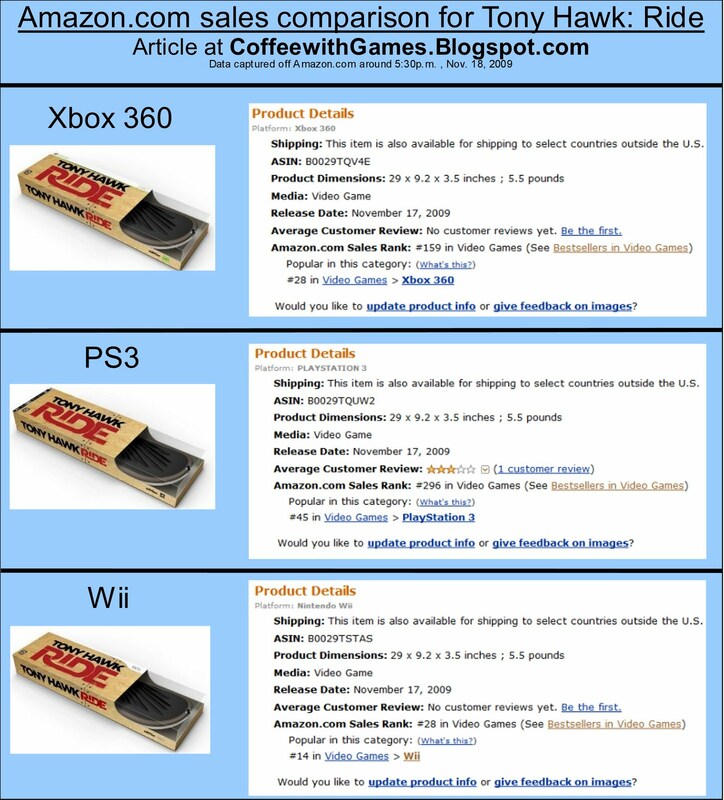 I've applied the statement, "the proof is in the pudding" to the gaming world, particularly, the idea that Wii games sell well, despite being reviewed poorly. Analyzing what analyst Michael Pachter said, "A well positioned game with an interesting concept can sell well on the Wii regardless of review scores..."
For the sake of this example, "pudding" would be poor review scores for games, and "proof" would be how well those games sold. Is Michael Pachter correct? Are there Wii games that have sold millions of copies that were reviewed poorly, or "regardless of review scores"? Absolutely! 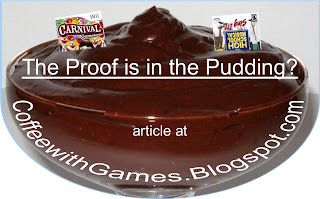 The "proof" is Wii games like Carnival Games and Deca Sports that have reportedly sold a million copies or more, and the "pudding" is that Carnival Games has a MetaCritic average score of 56 out of 100, while Deca Sports has a MetaCritic average score of 50 out of 100. While some may think those games are poor examples to use, let's take a look at several games that have only been out a few weeks. What do you think of the information displayed in the photo? I find it very interesting that Tony Hawk: RIDE is outselling both, Call of Duty: Modern Warfare [Reflex] and Resident Evil: The Darkside Chronicles. All three games come from established franchises, but Tony Hawk: RIDE is also more than double the price of Resident Evil: The Darkside Chronicles and Call of Duty: Modern Warfare [Reflex]! How is it that Tony Hawk: RIDE on the Wii has a higher sales rank than does Resident Evil: The Darkside Chronicles and Call of Duty: Modern Warfare [Reflex]? 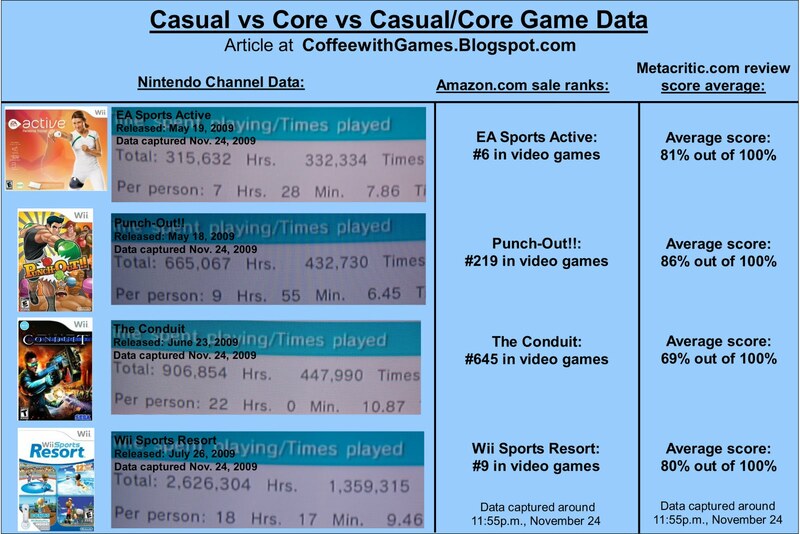 2) The Wii's "casual" crowd that "...wouldn't know Metacritic if it fell on them. ", is buying the game because they are used to Wii games selling with peripherals, and they want to try something new. Tony Hawk: RIDE is another example right now of a game that is reviewing poorly, but selling better on Amazon.com than other games that have reviewed better than it. What do you think of the Wii's game market and the way seemingly "bad" games, sell well. 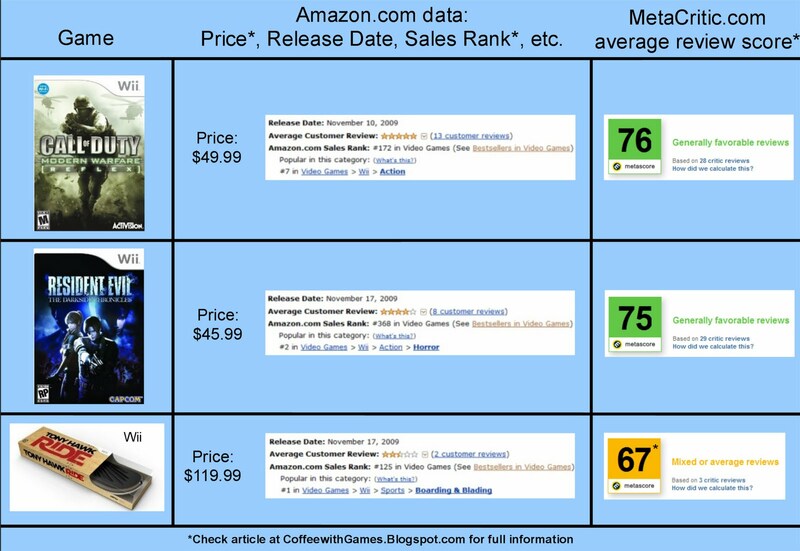 *The prices, sales rank, and Metacritic.com score averages were gathered on Sunday, November 29, between 4p.m. and 5p.m. MetaCritic scores not important, but genre and franchise continuations are. Pachter says MetaCritic scores aren't important. Wii software doesn't review well. THQ, high review scores bring in high sales. The pressure of MetaCritic scores. Critics Speak, We Listen, Why? Do Game Journalist Lack Morals? Eidos asked low scores held back. Today, being Thanksgiving, many gamers sat down with family and friends to enjoy a Thanksgiving dinner, and many of those dinners probably had turkey as the main meat of the meal. How is it, that turkeys seem to be loved most by Americans, only after turkeys have been baked/roasted/fried and are being eaten off our plates, instead of when they're flying around, gobbling, or running like crazy? I think the same sort of thought pattern happens in the gaming world. We tend to favor certain gaming companies, whether it's Microsoft, Nintendo, or Sony. If you game, you probably have a favorite console or gaming company. Though we may enjoy the games and consoles, I would say gamers don't always agree with every decision a gaming company makes, or sometimes with what a representative may say. Instead of enjoying the companies flying high, we prefer to roast them with our words, like many turkeys on Thanksgiving are roasted in ovens, when the gaming companies do or say something we don't agree with. So, what's all this turkey talk? The Gaming Turkey Award! The Gaming Turkey Award goes to either a gaming company or a person within the gaming industry, that through actions or words have caused uproars and have been roasted/baked/fried by the community of gamers. EA Sports Active had 42,281 players report data on the Nintendo Channel, an increase of 918 players from the previous week. Punch-Out!! had 67,089 players report data on the Nintendo Channel this week, an increase of 1,493 players from last week. The Conduit had 41,213 players report data on the Nintendo Channel this week, an increase of 938 players from last week. Wii Sports Resort had 143,690 players report data on the Nintendo Channel this week, an increase of 6,346 players from last week. 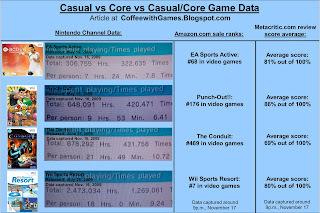 As the picture shows, Wii Sports Resort crossed 2.5 million total game-play hours reported on the Nintendo Channel and The Conduit crossed 900,000 total game-play hours reported on the Nintendo Channel. I was surprised that Call of Duty: Modern Warfare [Reflex] that was released on November 10, didn't debut this week on the Nintendo Channel. The Conduit and Wii Sports Resort both had data show up on the Nintendo Channel within about two weeks of their releases, but so far, Call of Duty: Modern Warfare [Reflex] is a no show. Also, New Super Mario Bros. Wii debuted this week with data on the Nintendo Channel, and it looks like it'll move up quickly, but I don't think it'll be a long burner with data, due to the short length of the game. Is anybody still playing Wii Sports Resort that bought it on release day? If anybody that has played or is still playing The Conduit, do you think it will cross 1 million total game-play hours before the end of the year? Three years ago today, on November 19, 2006, Nintendo released the Wii. Since the Wii's release, Nintendo has done several updates to the system, and one of the updates was the Nintendo Channel. I've been posting the data for several games off the Nintendo Channel for several months now. Today, I'll be showing games that were released with or very close to the release of the Wii, and how those games have performed over the last three years. The Legend of Zelda: Twilight Princess has had 932,842 players reporting game-play data. Excite Truck has had 171,500 players reporting game-play data on the Wii's Nintendo Channel. Call of Duty 3 has had 220,751 players report game-play. Need for Speed Carbon has had 144,593 players report game-play data in nearly the last three years since the Wii's release. 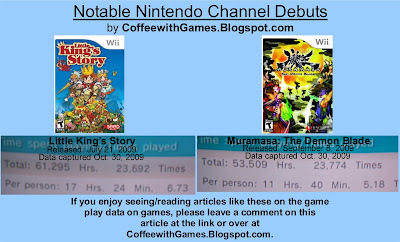 These were the only four games, other than Wii Sports, that I saw with game-play data showing on the Wii's Nintendo Channel. I was very surprised to not see Red Steel and Rayman Raving Rabbids showing data, as I'm curious to know how Red Steel and Rayman Raving Rabbids did game-play wise. What was the first Wii game(s) you purchased with your Wii? Looking back, how do you think that game(s) would play now, if you haven't played them in a while? What were you playing three years ago, today? 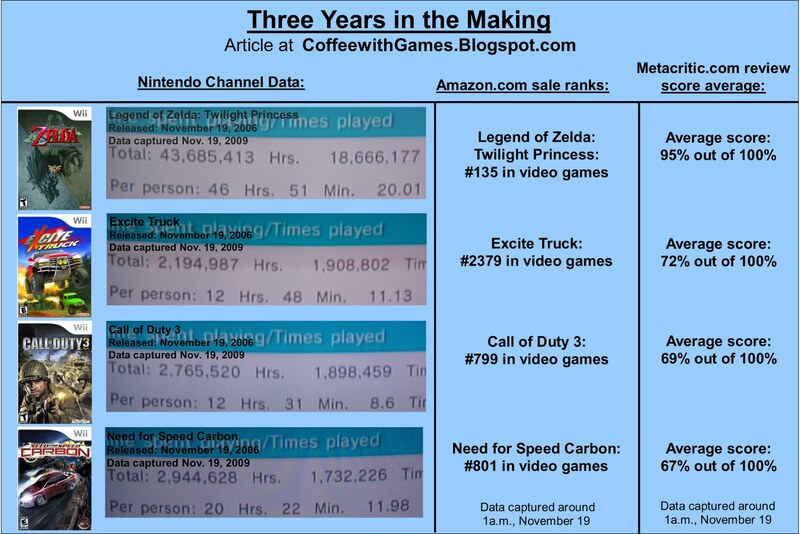 So, how has Wii Sports done compared to these other games. I know I posted some numbers for Wii Sports about two weeks ago, but you can have another look at the updated numbers for this week! Wii's Nintendo Channel Data for Wii Sports! Wii Sports has had 2,790,530 players report game-play data on the Wii's Nintendo Channel since it released three years ago. 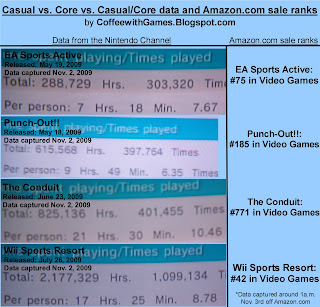 Wii Sports is also currently the most played Wii game as of Total Hours reported played. *It should be noted, that the data collected off the Nintendo Channel, is not updated on a daily basis, it is updated on a weekly basis. The game-play shown, would probably be from Nov. 19, 2006, probably through Nov. 15, 2009. EA Sports Active had 41,363 players reporting data, an increase this week of 894 players reporting data. Punch-Out!! had 65,596 players reporting data, an increase this week of 1,490 players reporting data. The Conduit had 40,275 players reporting data, an increase this week of 992 players reporting data. Wii Sports Resort had 137,344 players reporting data, an increase this week of 6,277 players reporting data. I think The Conduit is going to see a pretty significant decrease in the average number of hours reported each week, now with Call of Duty: Modern Warfare [Reflex] being released. I'll keep an eye on both, and see if it looks like The Conduit has been affected by Call of Duty's release. EA Sports Active will be interesting to watch, because of the release of EA Sports Active: More Workouts this week. Wii Sports Resort and Punch-Out!! both seem to be in their own little world, increasing steadily each week and have more of an increase in players reporting data each week. 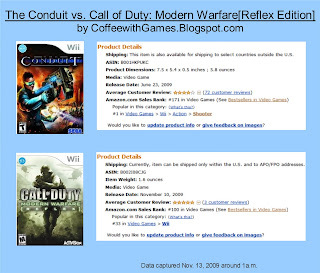 Did you buy Call of Duty: Modern Warfare [Reflex], or do you own The Conduit and are sticking with it instead? For anybody that has played EA Sports Active, do you want to purchase EA Sports Active: More Workouts and do you think the price of $39.99 is good for the sequel? Super Smash Bros. Brawl: Wii Nintendo Channel Game Data: 100,000,000 Hours! It's only been a few weeks since I posted up that Wii Sports had crossed 100 million hours of game-play hours reported on the Wii's Nintendo Channel. Now, with today's Nintendo Channel game-play data updates, Super Smash Bros. Brawl has crossed 100,000,000 hours of game-play! As the picture shows Super Smash Bros. Brawl has 100,278,406 reported total hours of game-play, making it only the second Wii game to cross 100 million hours of game-play reported on the Nintendo Channel, unless I've missed another one. 1,364,932 players have reported game play data for Super Smash Bros. Brawl, according to the data provided on the Nintendo Channel. Approximately 617 days from Super Smash Bros. Brawl's release date of March 9, 2008, it crossed 100 million hours of game-play. 1 year, 8 months, 7 days excluding the end date. While it took Super Smash Bros. Brawl 617 days to cross the 100 million hour mark, Wii Sports' data was captured 1079 days from it's release, showing it had crossed the 100 million hour mark. Mrs. Coffee bought me Super Smash Bros. Brawl for as a wedding anniversary gift one yaer...I had never gotten into the Smash Bros. games before, and I still didn't even after receiving it as an anniversary gift. I ended up trading the game in, in April or May of this year and put it towards The Conduit, with her knowledge of course! 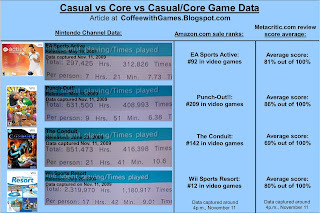 I know friends that love the series and really enjoy it, and I think the game-play data for Super Smash Bros. Brawl shows that this type of Nintendo "fighting" game is played A LOT by people, and I'm wondering if Nintendo will in the near future try to bring the Smash Bros. series to the Nintendo DS/DSi handheld systems. Do you own Super Smash Bros. Brawl? 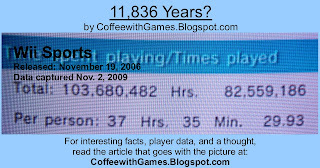 If so, how many hours have you contributed to the game and it's 100 million hours of reported game-play? Call of Duty: World at War was released November 11, 2008 on the Wii. I've been tracking Call of Duty: World at War's Nintendo Channel data on the Wii for a few months now, and it's been increasing more than 100K hours every week that I've been following it. Over the last year, according the the Wii's Nintendo Channel data, Call of Duty: World at War has amassed 6,897,580 hours of total game play data, from approximately 137,925 players. I played A LOT of Call of Duty: World at War on the Wii. I bought the game at the very end of December and played it pretty consistently through April. I finally beat Call of Duty: World at War on Veteran difficulty, which was absolutely insane, in October. Call of Duty: World at War is my most played Wii game to date, which I find a little odd, considering I bought my Wii one week after it's release, and didn't buy Call of Duty: World at War until more than two years later. Being that Call of Duty: Modern Warfare [Reflex] just released on the Wii, if you played Call of Duty: World at War before, how would you rate Call of Duty: Modern Warfare [Reflex] to Call of Duty: World at War? 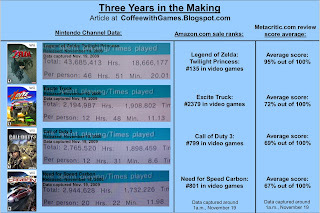 Do you think in one year's time, that Call of Duty: Modern Warfare [Reflex] will pass Call of Duty: World at War's one year totals for game play data on the Wii's Nintendo Channel? While I was researching the NPD data for the last blog post, I was looking at NPD sales for Madden over the period of the last year. I was looking mainly at the release month sales for the game, being NPD numbers for August of 2008 and August of 2009. How do the NPD numbers compare for Madden's release in 2008, to Madden's release in 2009? Let's take a look! Sales for Madden NFL 10 fell on every single console this year, EXCEPT the PS3. The PS3 sold 22,000 more copies this year, than it did last year, a little more than a 3% increase in sales. The Xbox360 saw Madden NFL 10's sales fall by 72,000 copies, 7.2%, from Madden NFL 09's sales. The PS2 saw Madden NFL 10 sales drop by 264,500 copies, dropping a little more than 62%, making it the biggest loser in percentage of sales lost. The Wii sold 48,800 fewer copies, with sales decreasing a little more than 42% year-over-year. Madden NFL 10 sold 363,300 fewer copies, than Madden NFL 09 did it's release month. Madden NFL 10's August release sales dropped nearly 17%, from last year's Madden NFL 09's August release NPD numbers. The PS2's 264,500 fewer copies, accounts for almost 73% of the total sales lost, in August, for Madden NFL 10. The title of the blog is "Madden's Magic Trick". I named it that, because I think it's crazy how 363,300 buyers of the game seemingly vanished in one year. I would think Sony is happy on one hand, that the PS3 saw an increase in sales, but maybe baffled at the large drop in sales of the PS2 version. If I was Microsoft, I would be a little concerned by the 7.2% decrease, especially when looking at September's sales for Madden, and knowing how much of a drop off happened from August sales to September sales. If I was Nintendo, I would look at the sales of Madden this year, and see a HUGE opportunity for a Nintendo Wii football game of some sort. If I was EA, I probably wouldn't develop/publish Madden on the Wii anymore. Do you think EA will release another Madden on the Wii, or will Madden NFL 10 be the last version on the Wii? Did you purchase any version of Madden this year? If so, leave a comment and let me know what you think of the game! I'd love to hear your thoughts on how Madden NFL 10's sales were down nearly 17%, and if you're surprised by that, or if this is what you've been expecting to happen to the Madden series. *Numbers in article are comparison of first month sales NPD data. Madden NFL 09 was released on August 12, 2008. Madden NFL 10 was released on August 14, 2009. Football season is well underway this year, both for the NCAA and the NFL. I know friends that follow the NCAA games, and they don't really care about the NFL games. I have friends that follow the NFL games, and don't care about NCAA games. I also know friends that follow NCAA games, as well as NFL games. I, myself, follow just the NFL and don't care much for the NCAA. NCAA Football 09 All-Play has been the only NCAA football game released on the Wii, and it came out last year on July 15, 2008. Electronic Arts also released Madden NFL 09 All-Play for the Wii last year on August 12, 2008. Hearing a lot of talk of NCAA college games this past week, and in particular today with the LSU versus Alabama game, got me wondering. I wondered why Electronic Arts canceled the NCAA games on the Wii after last year's release, so I decided to see if the Nintendo Channel had any game play data for NCAA Football 09 All-Play, or if the game sold so poorly, that the hours never got high enough to have any data reported. 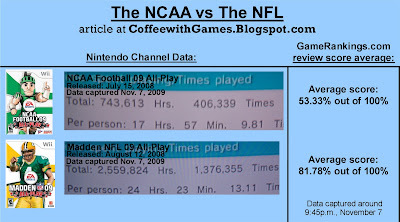 Take a look at how NCAA Football 09 All-Play and Madden NFL 09 All-Play compare with data from the Nintendo Channel! NCAA Football 09 All-Play has about 41,421 players reporting play time data on the Nintendo Channel. According to VGChartz, NCAA Football 09 All-Play has sold about 130,000 units. If 130K is the correct number of units sold, that would mean about 32% of the players are reporting data on the Nintendo Channel. 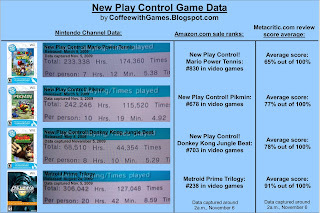 Madden NFL 09 All-Play has about 104,985 players reporting play time data on the Nintendo Channel. According to VGChartz, Madden NFL 09 All-Play has sold about 820,000 units since it released. If the VGChartz numbers are correct, that would mean only about 13% of Madden's players are reporting data, compared to NCAA's 32% of players. I find it interesting, that according to the NPD data from last August, Madden on the Wii sold 115.8K units in just August last year, yet in the entire year following Madden's release, it wasn't able to get 115.8K players to report data on the Nintendo Channel out of the supposed 820,000 players that purchased it. I think NCAA Football 09 All-Play's review score of 53.33% is horrible, and along with low sales, may be what contributed to Electronic Arts canceling NCAA on the Wii this year. Have you played either of these games, if so, what is your opinion of either of them? Do you have a favorite NCAA team or NFL team? I haven't played either of these football games on the Wii, the last football game I played on the Wii was Madden 2007. I don't have a favorite NCAA team, but my favorite NFL team is the Tennessee Titans, even with their awesomely horrible 1-6 record this year. EA Sports Active has 39,546 players reporting data. Punch-Out!! has 62,640 players reporting data. The Conduit has 38,380 players reporting data. Wii Sports Resort has 125,186 players reporting data. The Conduit has the fewest players reporting data, and is behind in sales rank on Amazon.com, but The Conduit shows that the number of games sold, doesn't equal number of hours played. Punch-Out!! 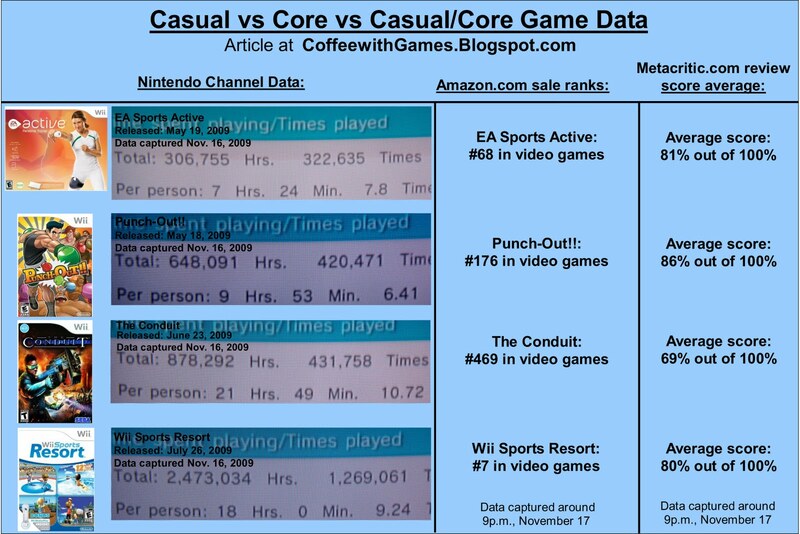 and EA Sports Active are outselling The Conduit on Amazon.com on a regular basis, but The Conduit is being played more, even with fewer gamers reporting data...at least according to the Nintendo Channel numbers. Do you think Punch-Out!! or EA Sports Active will catch The Conduit in game play hours, once another online multi-player FPS, such as Call of Duty: Modern Warfare [Reflex Edition] is released? 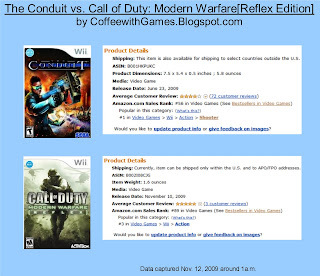 Or do you think The Conduit will continue to get game play hours like it has been and won't be affected by Call of Duty: Modern Warfare [Reflex Edition]? It was reported on November 2, that Wii Sports Resort has crossed 7 million units sold world-wide, since its release.